B.J. Coleman copied Peyton Manning’s drops and play fakes to a “T.” Here’s a look at both guts and in flawed decision-making by the young prospect with late-round value. Photo by chattanoogaalumni. 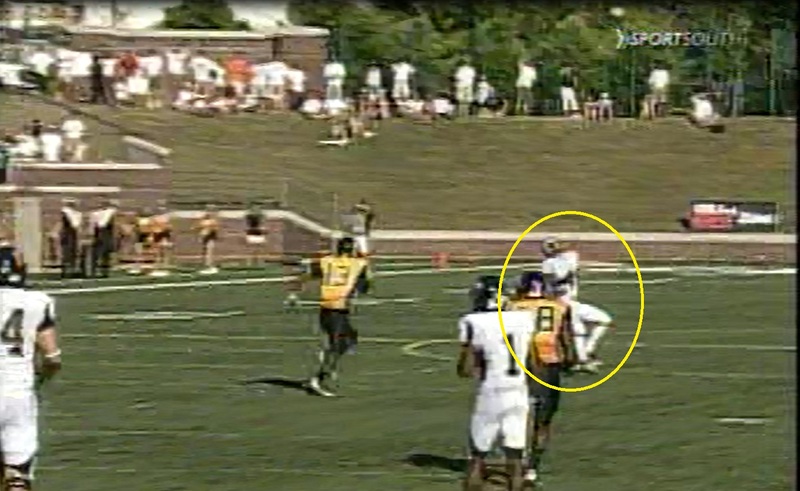 A few weeks ago, I profiled East Carolina receiver Lance Lewis and demonstrated how his fade routes often appear identical to Patriots receiver Brandon Lloyd. 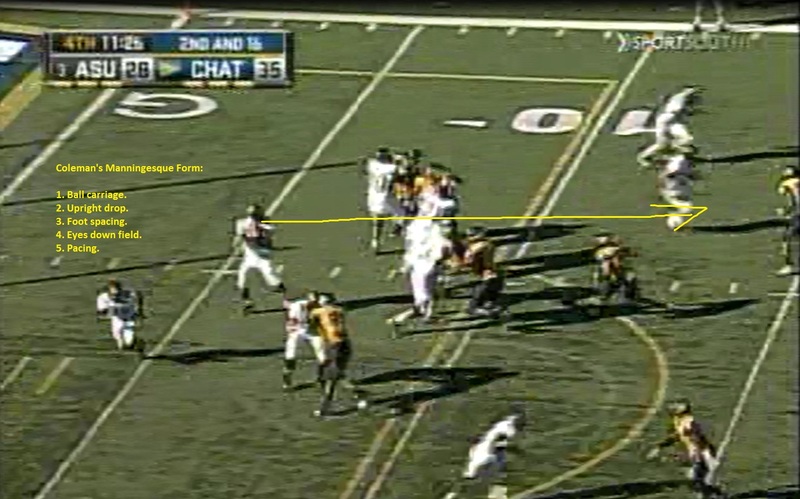 In that post, I mentioned that University of Tennessee-Chattanooga QB B.J. Coleman’s drop, play fake, and release of the football is no different than Peyton Manning. Coleman voraciously studied Peyton Manning’s game as a redshirt freshman at Tennessee before transferring to Chattanooga and it has paid huge dividends with his fundamentals. You have to admire a young player like Coleman to copy the best fundamental physical skills of a great like Manning. I bet coaches and GMs wish more players would take this initiative to do the same with the same level of detail. As much as Coleman demonstrates basic promise as a player, the difference between a fundamentally sound young quarterback with skill and technique and a grizzled pro is experience and perspective. And these two “intangible” qualities produce wisdom and that’s something quarterbacks sorely need in the NFL. 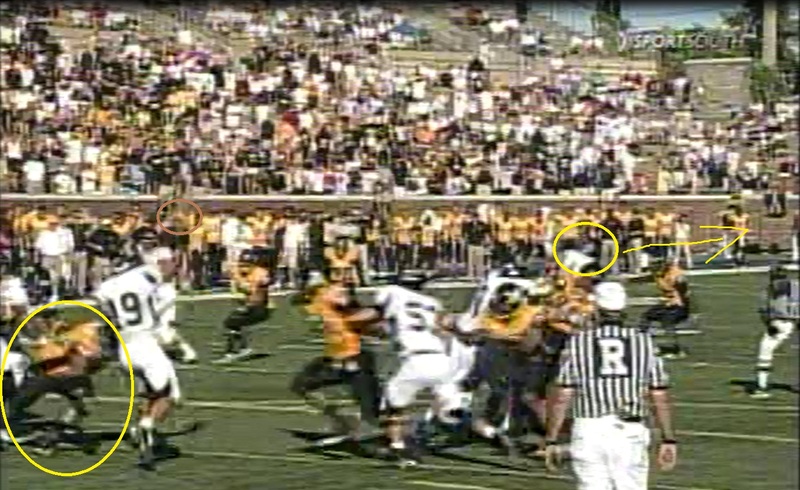 The play below is in the fourth quarter of the UTC – Appalachian State game where Coleman throws three touchdowns in the first half to build a 21-point lead. However, after UTC allows Appalachian State to score a rushing touchdown, induce UTC to fumble away a kick return, and then generate a second rushing touchdown, Coleman’s team has seen its lead cut to seven points in less than ten plays. One of the problems the manifests in the fourth quarter is the play of Coleman’s left tackle, who is wearing down and getting beat by the rush off the edge. After getting sacked on 1st and 10, Coleman attempts a deep pass on 2nd and 16 with 11:30 left from a 2×1 receiver, 11-personnel set. 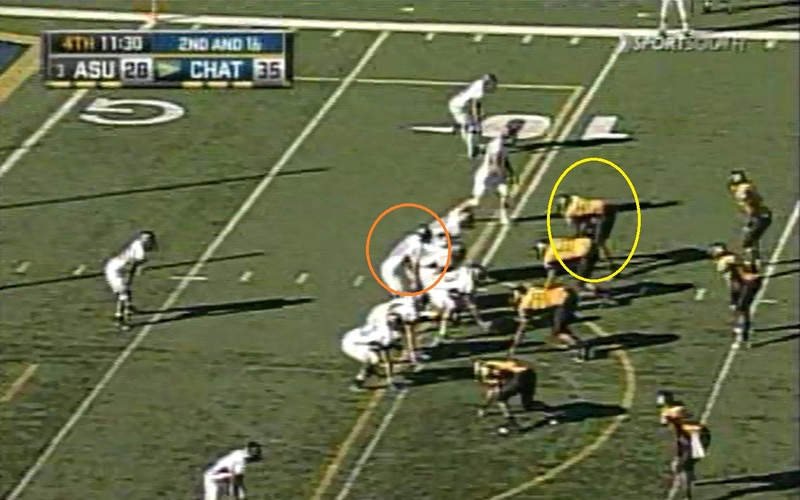 Coleman was sacked by No.54, the DE circled in yellow on the previous play. Look at the down and distance situation. This is something the UTC QB should have been considering. At the snap, Coleman drops five steps, uses a pump fake that was more of a slow motion movement, and then delivers a pass with the defensive tackle hitting him in the legs as he lets it fly from his own five. Coleman looks off the safety as he takes a deep drop into his own territory to set up a deep pass with a pump fake. Watching Coleman execute a pump fake as he finishes his initial drop. The timing helps him take fewer steps, but at the same time makes the pump look more believable. The pump in what is a clean pocket for now. Coleman did an excellent job of lofting the ball down the left hash despite taking the hit below. This aggressive mentality is something you want from a quarterback. However, there’s a fine line between aggressive and reckless. The next play is a good example. 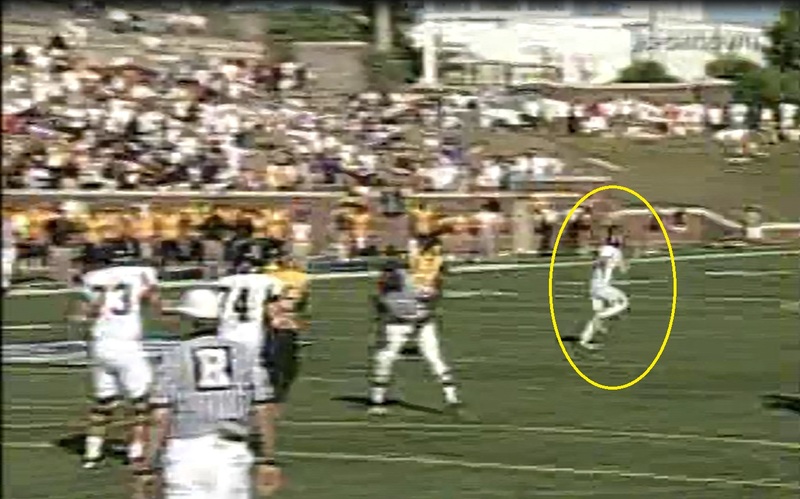 Although this isn’t a pinpoint throw, Coleman’s deep post under heavy pressure is placed down field and lofted for his receiver to turn back and catch the ball like an outfielder. Coleman gives his receiver an easy opportunity to make the play, while still limiting his opponents from getting into the area to make the play. That’s an aggressive type of move. 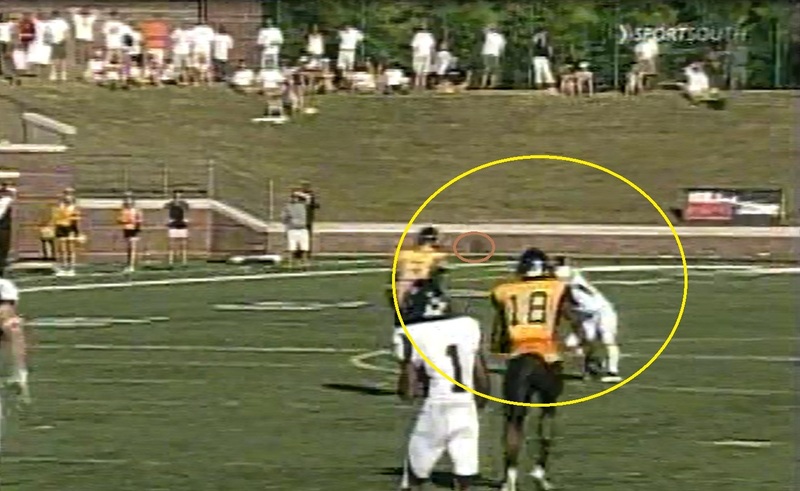 Coleman’s receiver turning his head to track the ball. Coleman’s receiver losing track of the ball as he turns inside for the pass. The ball arrives too wide of target. The receiver is five yards behind the nearest defender and has a chance to turn backwards and catch it like an out fielder. However, he trips trying to move towards the outside to catch the ball and I think he lost it in the sun. It was an excellent throw under pressure because he read the coverage and the pump set up this slant and go so he could place the ball where he did. 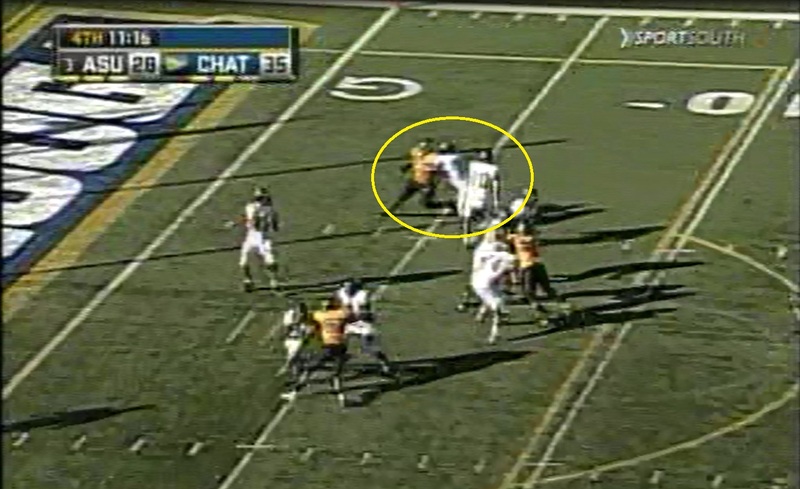 This should have been a 35-yard completion on a 40-yard throw while getting hit. Gutsy, aggressive play that should have resulted in a first down and cutting the field in half. None of these details should say “take your time with the football.” With a seven-point lead inside my own 10 yard-line, it’s time to make a quick, safe play and if not comes open immediately, throw the the ball away and punt.That of course, is not the outcome.Coleman is 16-24 for 253 yards with three passing touchdowns and one rushing touchdown on the day. He actually calls timeout and then when the play resumes, Coleman comes to the line in an 11-personel, weak side trips versus a 3-3-5 with the DE No.54 at a wide-nine position outside the LT in a three-point stance. The position of the DE is one of the reasons why Coleman has the TE alongside the LT.
Coleman at least has a TE helping the LT against the wide nine DE off the blind side. After the snap, Coleman drops to his own two and as he looks down field the TE is overwhelmed by the DE and the LT stops and stares to his outside to watch the entire strip/sack in a few frames. 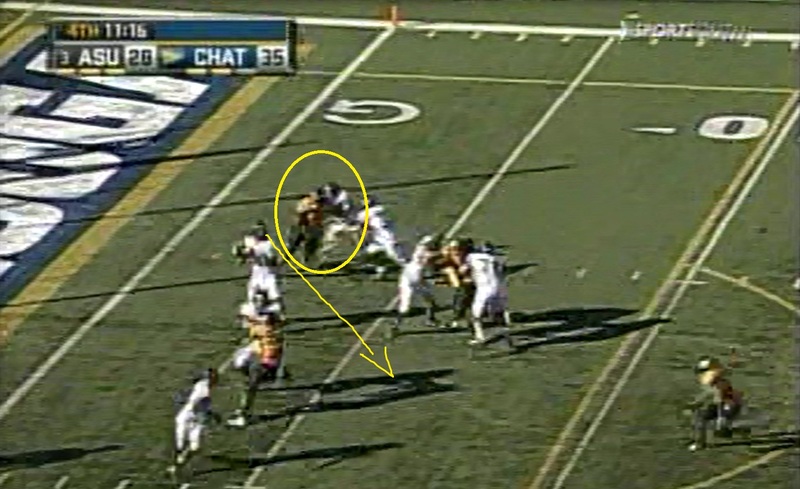 Why the LT would think the TE could handle the DE without his help is a mystery. The QB now turns to his second read. This is the point he needs to release the ball. 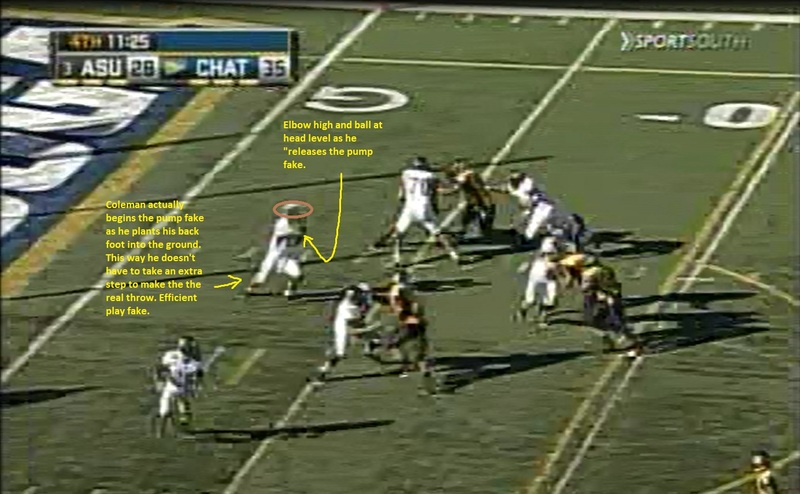 Maybe even earlier than normal on 3rd and 16 inside his own three with a lead that’s been cut short to seven. The result of Coleman trying to be a hero was a sack and a fumble. The backside DEgot around the end fast enough to strip the ball from Coleman’s hand before he could deliver the ball to his right side. Coleman brings the ball back in and the just as he’s beginning his delivery, the DE knocks the ball free. I can’t say Coleman was in the pocket too long, but holding onto a ball in this situation on the field is reckless. If you can’t spot one of two progressions in your end zone, looking for a third as the pocket collapsing is reckless rather than aggressive. They were deep in their own territory inside the 15 and Coleman is dropping inside the five and up by seven on a third down in the early fourth quarter with all the momentum on the opponent’s side. He should have played his snap more conservatively. Take the sack or throw it away early rather than hand back the momentum on a silver platter. It’s lessons like these that will teach Coleman the hard way to adjust his decision-making to down and distance. Bill Belichick calls it situational football and he coaches to it. Coleman may mimic Manning’s physical play, but it’s the brain that makes the difference. It may see like an intangible skill, but the turnover was touchy-feel. However, I’m rather skeptical of B.J. Coleman’s value as an NFL QB given his relatively mediocre NCAA stats compared to other NFL QB prospects, especially given the level of competition he played against. Specifically, his completion percentage and ypa are nothing to write home about. I suppose it’s a positive to look like Peyton Manning on the field, but a lot more difficult to perform like him. Would you happen to know of any QB’s who managed to improve so much, they actually put up better numbers in the NFL, then they did in college? Great work on your part if he happens to stick around on NFL rosters for 5+ years though. I can name one right away: Rich Gannon. 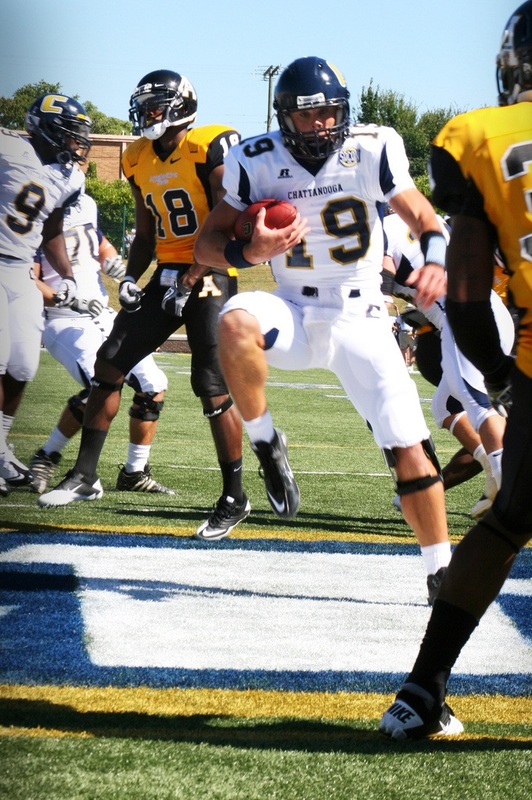 Gannon had a career completion percentage of .547 and his best year was a .557. He was a fourth-round pick who spent years on various team benches until he developed into a passable starter and then eventually an NFL MVP and pro bowl QB. Some stats tell a results-oriented story but in some cases are more difficult to at providing a behavior-oriented narrative about individual mechanics and behaviors that can be improved/fixed to increase those results. If you’re monitoring output of a machine and that end result stats aren’t good then it is time to go observe the machine and look at the techniques and behaviors of that machine. You then fix those individual behaviors. While there’s obviously more to it with human performance the principle is essentially the same. This made me rewatch the Shrine Game – my lady loves to watch me get sucked into football all year around espcially at 1am!!! Quick Q – at .55 mark on that PA pass – would you call that a “pushed” ball – Ive always called it shot-putting but its a tearm I hear Mayock use recently that I wanted a more clear definition of. He stated people use that technique to compensate for a weak arm. He may fake like Peyton but he doesnt release at the highest point like him. Manning is always standing tall too. 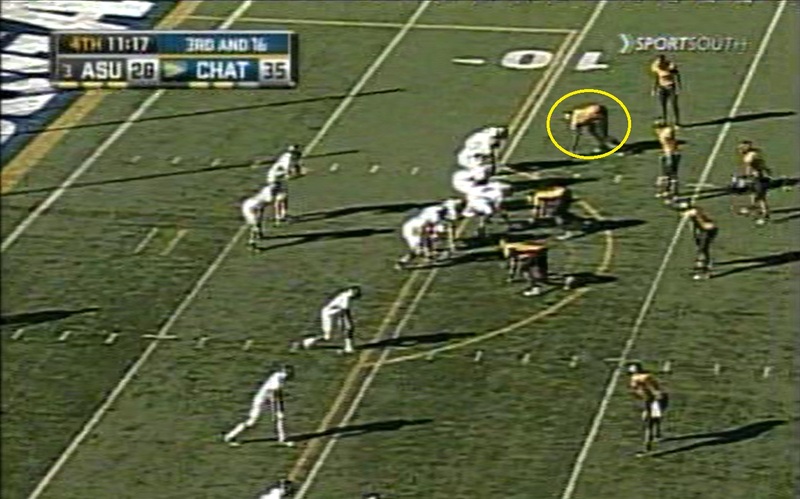 At .55 he seems to be squatting on that play. Also, form what I remember of Mike McMahon out of Rutgers there are similarities for me. Just a bit all over the place – nothing specific – its just that he looks good and terrible in the same play. You want to watch them and root these 2 examples on but it always falls apart! I became fond of Mike Mc because as bad as he was he was more watchable than Joey Harrington. I cant imagine this guy as more than a practice squad guy. If you mean 0:55 Shuffle, I think there are two comments I can give you. I don’t see Cunningham “pushing” the ball. The release may not be as high as Manning’s, but the elbow is at, or above, the shoulder and that’s the critical technique point you want to see. If the elbow is below the shoulder then this is where QB’s have to compensate and push the ball an overcompensation of other body motion. That’s not happening here. The squat-standing tall thing is on a stretch play where the QB has to do a decent amount of lateral movement built into his drop. While he’s not straight up and down like I have seen him in a game like the one from App State, this is not adversely impacting his delivery on this intermediate throw. As I mentioned at the top of this piece, it’s admirable that Cunningham has worked on building his game from the foundation-up. However, he still has a ways to go before he can be thought of as a starter. The thrust of this piece is to point out that good mechanics are a start, but decision-making is a huge factor in development and this takes a lot of time. It’s also something that even physically talented throwers never grasp and therefore never progress beyond a clipboard in the NFL. 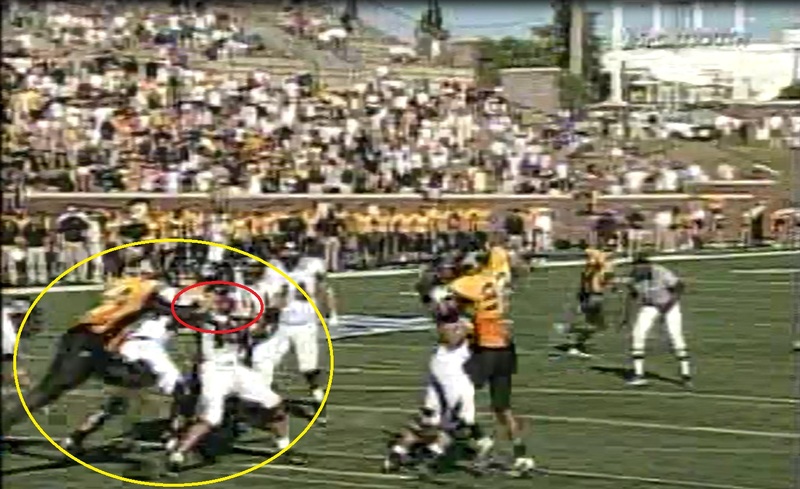 I will say if you have a chance to watch this game vs. App State, you’ll see the natural arm strength and the willingness to stand in the pocket to deliver the ball with bodies around him and making contact.